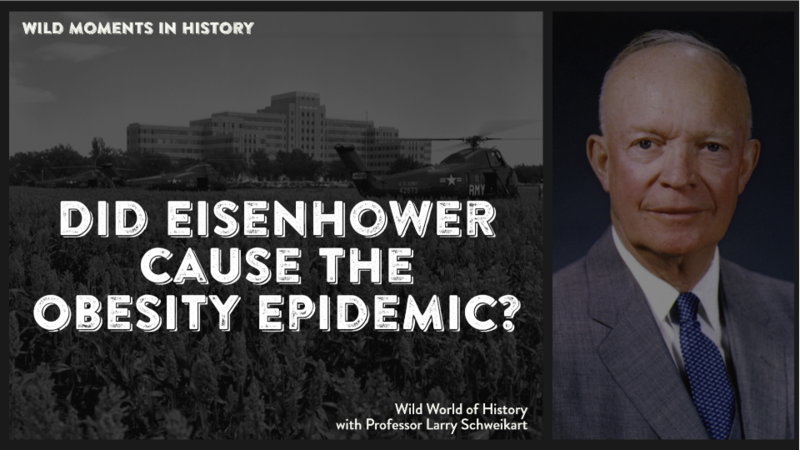 Did Eisenhower Cause the Obesity Epidemic? Did you know that wight D. Eisenhower’s heart attack in 1955 changed the way we eat . . . and may have brought on the obesity epidemic? While playing golf in Colorado in 1955, President Dwight D. Eisenhower complained of indigestion. Given something for heartburn, he returned to the home of his mother-in-law, where he and his wife, Maime, were spending the evening. Later that night, Ike complained of chest pains, but even then he wasn’t taken to a hospital. Finally, 12 hours later, he went to the Fitzsimons Army Medical Center and the chief cardiologist at Walter Reed Army Hospital, who arrived the next day, was convinced Ike had had a heart attack that was misdiagnosed. Whether Ike meant to be or not, he soon became one of the most important medical cases of the 20th century because his treatment soon encapsulated all of the “heart-healthy” eating practices that are familiar today. Going on a post-attack diet of more fruit, fewer meals, fewer calories—everything designed to reduce the cholesterol that doctors thought was the culprit—Ike’s low-fat diet increased his cholesterol count. Indeed, cholesterol now became a household word and was associated with fats, meats, and protein. Ike, though, perplexed his doctors. He ate less, exercised more, and ate only the prescribed low-fat diet . . . yet he gained weight. And when his weight finally stabilized, his cholesterol rose to what some physicians might call dangerous levels. At the very moment Eisenhower’s physician was concealing cholesterol reports from his patient—thinking cholesterol caused the heart ailments, Time magazine was celebrating Ancel Keys, a University of Minnesota physiologist who insisted that a low-fat, low-cholesterol, carbohydrate-heavy diet would prevent heart disease. The American Heart Association (AHA) endorsed the Keys diet. In fact, there had been no increase in the number of heart disease cases, but rather an improvement in detecting them. Between 1961 and 1977 there was virtually a tidal wave of research on the causes of heart disease, but no clear evidence of what caused it. Even before the evidence from two of the biggest studies came in, both the AHA and the National Institute of Health were veering sharply toward carb heavy and meat-light diets. Throughout this time, data that didn’t fit Keys’s hypothesis was concealed or ignored, including studies of Navajo Indians, Irish immigrants to Boston, African nomads, Alpine farmers and others. Government got into the act: in 1977, the McGovern Committee released its Dietary Goals for the United States, in which Uncle Sam got into the business of telling people what to eat. The goal of the committee? Increase carbohydrate consumption, and reduce fat/meat consumption. Over time, this recommendation would not only prove unhealthy, but would produce in part the single biggest epidemic in the U.S.—the obesity epidemic. Following the introduction of the Atkins diet in 1992, then later by numerous studies, the “fat hypothesis” was not only disproven, but tests showed that in fact the “Mediterranean” diet of higher fat and meat levels was actually healthier. Ike probably knew that before his doctor put him on a diet! For more, see Larry Schweikart, Seven Events that Made America America and Gary Tubes, Good Calories, Bad Calories.